This is eerie and totally fascinating, an empty Camp Nou as Barcelona play Las Palmas with no crowd, following the Catalan Independence referendum. It’s the sounds you’re never really privy to during matches; the players talking to each other – “Luis, do me a favour!” – as Suarez tries to claim a penalty, or without the soundtrack that usually accompanies the action – the weird lack of drama as Messi insouciantly rounds the goalkeeper to score, for instance, or Suarez ripping his shirt after he misses… to a deafening silence. This description, from Sid Lowe’s excellent report for The Guardian, captures the strangeness of it all: “At 4.13pm, Barcelona’s anthem blared out. The referee came out of the tunnel and picked up the ball from that absurd plinth, hurriedly throwing down the one he had in his hand, and the players followed. Echoing round, the anthem opens with the line: “The whole stadium cheers; we’re the blue and claret people.” When it closed, a “brave cry”, the place fell silent and the whistle went, heard by all. There was no one in stands, where the mes que un club slogan sat exposed. The directors’ box lay empty. The board watched it from somewhere inside. So did the players’ families, a lift-load of kids leaving together at the end. Every shout was audible. A free-kick was greeted with “oh, so you give this one?”, there was something about a “mother’s shell”, and the standard call of any park anywhere: get out, push up, man on, quick, that’s it, near post, no foul, good. There’s something odd about actually hearing someone shout: “Leo! Leo! Here, Leo!” at Messi. Something odd about it all. Something sad too, a kind of what’s the point when it’s like this? But it was fascinating too. You could close your eyes and more or less follow the game, imagining the kind of pass delivered by the noise, the ball struck or stroked. Phwump or tac. 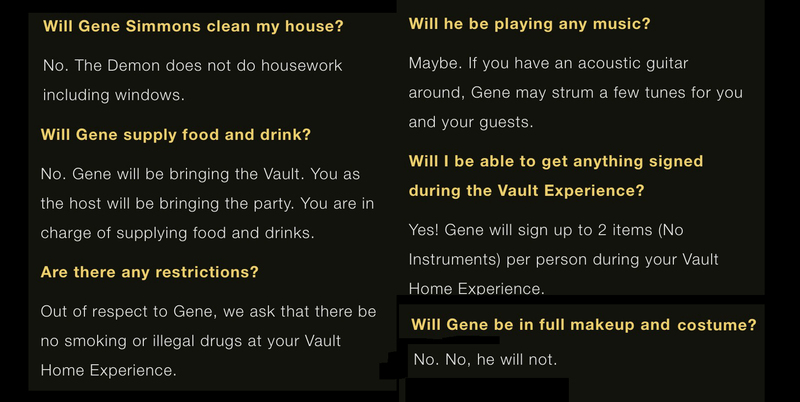 CAN I GET TWO COPIES OF GENE SIMMONDS VAULT, PLEASE? I hung it when setting up the workroom. It nestles in good company beneath Dylan by Antonin Kratochvil and Daniel Kramer, Neil Young by Henry Diltz, Woody Guthrie by Arthur Dubinsky, Leonard Cohen by Antonio Olmos, Ray Charles by Jim Marshall and David Bowie by the incomparable Antonin again. And the latest addition on the right – get your very own Jimi Hendrix English Heritage plaque. As a plate. Genius! TWO HENDRIX WALKING TOURS We’ve missed the Monterey 50 talks, and the Hendrix lessons go on throughout the year, but upcoming are three Hendrix Walking tours. All start in Brook Street at the Handel & Hendrix House. Lasting 90 minutes, they cost £15 each. 1) This tour visits other places where Hendrix lived, including addresses in Montagu Square and Upper Berkeley Street. The walk will also take in venues Hendrix frequented and the location of his last official interview. 2) This tour goes to the site of the studios where Foxy Lady was recorded, the location of The Experience’s first-ever rehearsal, and the venue where the band had their debut performance. 3) Finally, this tour visits the site of a number of venues that Hendrix frequented, including The Speakeasy, Bag O’Nails and the place of his last public performance. THREE VISIT SERGEANT PEPPER’S HOME I hear that the studio visit is excellent (it wasn’t running on the day I was passing) but the shop was a fine second prize. It usually has a small exhibit of rare photos and the actual tape boxes from Beatles sessions, alongside a wide variety of quite cute merch (“I am the Eggman” egg cups, anyone?). And it’s always fun to see the slight chaos as tourists interminably hold up the traffic recreating the Abbey Road cover. Click on the photo to enlarge. FOUR IN THE WORDS OF SONNY BOY WILLIAMSON, “HELP ME…” “I can’t do it all by myself…” I was organising my dad’s negatives the other day and came across this fascinating picture of a caught moment, shot on Ektachrome (which has faded to these lovely matt colours). 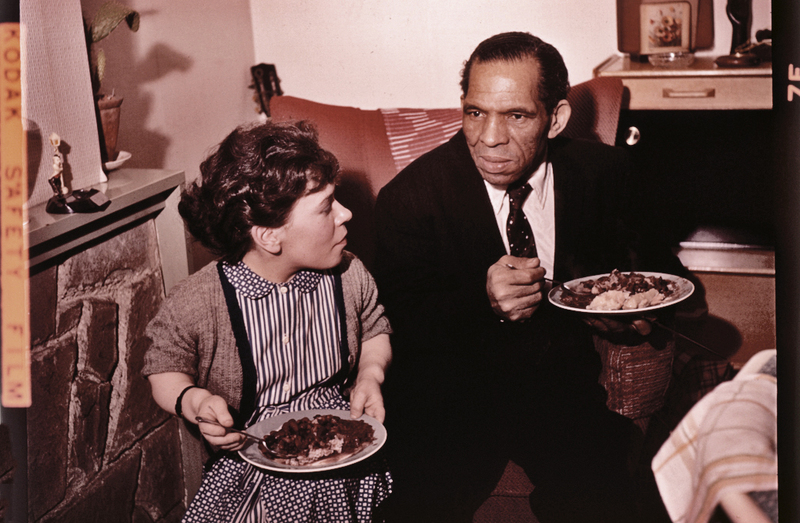 I’m assuming this is after a show, and I think they may be eating my dad’s approximation of Red Beans & Rice, but that’s as far as my knowledge/guesswork goes. So if anyone knows the subjects/situation, please let me know. [Thanks to Charlie Banks for revealing that the woman is Rosina Skudder, occasional vocalist with Ken at Studio 51]. FIVE BUY THE FIRST ALBUM RELEASED ON SOUTHWESTERN RECORDERS! Here at last… Forty-eight minutes of Mood Music for a Decaying World! Thrill to the sound of Theramins and eBows and mistreated guitars! Be amused by the attempts to build a song on the howling of coyotes! Hear the appropriation of Baby Dodds’ drumsticks! Find songs written in honour of Twin Peaks (the first time round)! 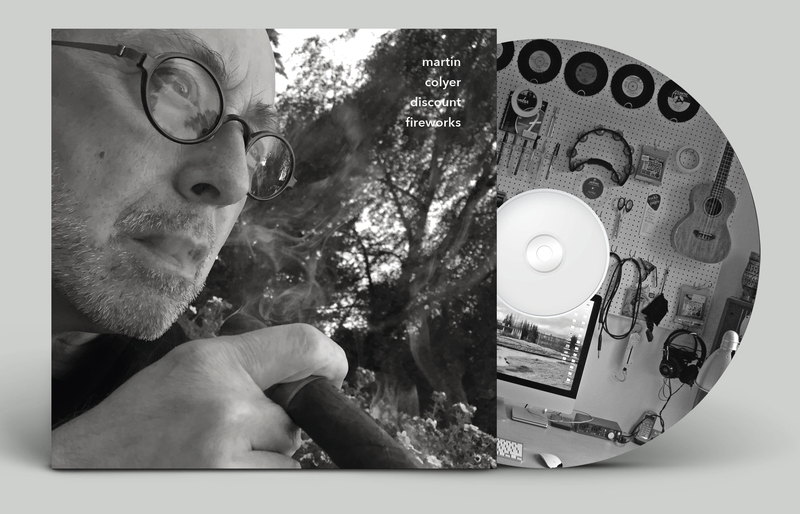 Go to the music player on the right for a taste, and if tempted, go here to order your very own hand-made copy. The first ten orders (I may be getting ahead of myself here) go into a Prize Draw for the chance to win a ticket to go with me to the Shepherd’s Bush Empire on 28th June to see Old Crow Medicine Show play Blonde on Blonde in its entirety. Bon Chance! If you’re receiving the e-mail out, please click on the Date Headline of the page for the full 5 Things experience. It will bring you to the site (which allows you to see the Music Player) and all the links will open in another tab or window in your browser. Playing Jimi Hendrix riffs. Not songs—just riffs. I figure he thinks that the most anyone hears is about 25 seconds, and that he should stick to what he does best, which involves a lot of flashy hand waving and facial grimacing. I gave him £1 for the way he fluttered his hand away from the strings after playing a particularly nice Purple Haze pastiche. Alone among the national anthems that I’ve heard at this Olympics, the Senegalese song doesn’t have militaristic percussion and brassy horns. It actually has a pretty, pastoral tune, which seemed to float round the stadium rather than bounce off the metal girders, as Uruguay’s did. Senegal went on to float past the Uruguayan defence and win 2-0, playing with ten men for most of the match. Re-parking the car late the other night. The street is eerily quiet, as is the car, and the radio unexpectedly leaps into life at top volume. Jesus! But it’s only our old friends, Simon and Garfunkel, singing The Sound Of Silence, in the Tom Wilson “Folk Rock Overdub Mix”. I’m not sure that I’ve ever really listened to this but it’s great. Subtly done, albeit in a chart-friendly kind of way, with Bobby Gregg particularly good on drums as he follows Simon’s fingerpicked acoustic. But it’s such a strange notion, isn’t it—to, without the knowledge, cooperation or consent of the act, re-shape the track so radically. And, in the process, reform the act and help to make it huge. Stumbled across two David Bowie artifacts this week: A bootleg of a 1980 TV Show recorded at the Marquee Club, Wardour Street, London, in late October 1973 for the American TV show Midnight Special. I remember that somehow we got tickets and queued down the Soho street for hours to get in. I wasn’t a great Bowie aficionado but I do remember the show, with all its stop/start filming and endless retakes, as being really thrilling. Bowie was backed by the Spiders From Mars, but with Aynsley Dunbar on drums. Luckily, Mick Rock, who was photographing it, wrote about it for Music Scene: “The space in the Marquee is too limited to permit the requisite number of cameras to film simultaneously, so each song had to be reshot from different angles several times. This entailed as many as five or six performances of the same song…. the atmosphere generated by Bowie’s own unique craziness swiftly transformed the clubhouse into something closely resembling a circus ring – Dali style. Throughout Bowie was very patient, very up. He filled in the intervals between takes rapping with the audience, teasing, laughing. After each song he would disappear immediately, reappearing dramatically on cue for the next one in a new costume. He was joined by Marianne Faithfull, in a nun’s cowl and black cape, for the last song, the old Sonny and Cher hit, I Got You Babe. He frolicked about in the true spirit of the song while Marianne watched him, deadpan throughout. During one long break between takes she turned and left the stage, and paraded a pretty bare bottom, as the split in her cape flew open.” I remember that quite vividly. 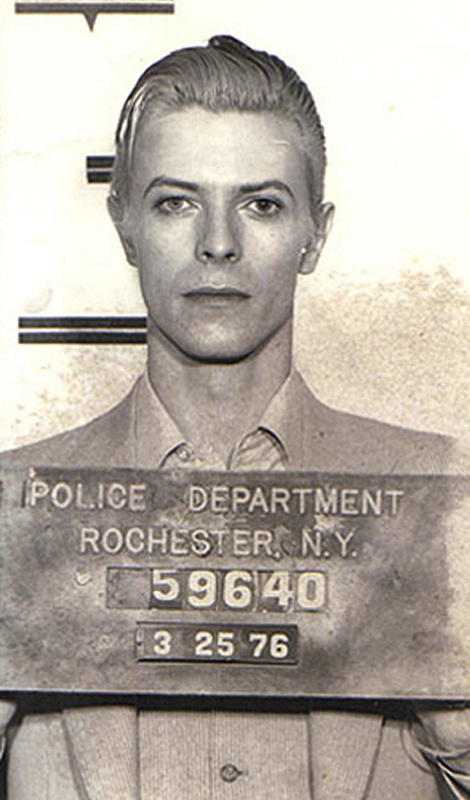 Secondly, this, the most composed, fashion-forward police mugshot of all time.